On February 9th and 11th, 2016, over 200 residents of Nueva Concepción, Escuintla, Guatemala, held an action that was historic for their municipality and for many peoples; they freed the Madre Vieja River from several dams that were diverting its water toward oil palm and sugar cane plantations. The Madre Vieja river runs for over 125 kilometers, starting at its tributaries’ headwaters in the Sierra Madre mountains, crossing the volcanic mountain range, to finally reach a system of mangroves at its mouth. Despite the degradation to which the river has been exposed from years of exploitation and misuse of its waters, it remains an important element for the life and livelihood of the communities, farmers and fisherfolks who live on its banks. The river still sustains important ecosystems and biodiversity. 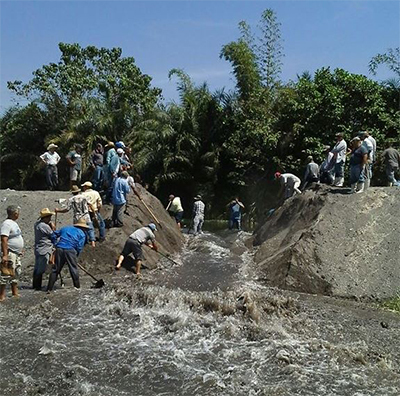 Our solidarity with the communities of Nueva Concepción Escuintla in their struggle to obtain access to water, and to liberate the Madre Vieja river from dams unjustly and illegally built by private interests of the Hame Group oil palm company, and by sugarcane and banana agribusiness. We request and urge the Guatemalan authorities to investigate the cases of diversion of rivers by palm, sugarcane and other agribusinesses, in order to guarantee local communities’ access to water, and to sustain biodiversity and important marine and coastal ecosystems, such as mangroves. We call on social organizations and on civil society in general to be alert to this case of human rights violations, in order to contribute to the dissemination of information and the fulfillment of the rights of affected communities. Rivers for life, not for companies.